Not sure? Give a gift certificate! What a deal! 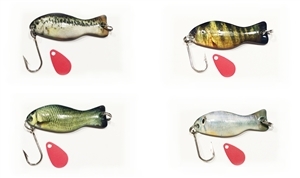 Get 4 of Al's living lures set up for ice jigging, then cast them in the spring. Great set of goldfish ice lures. Jig them in the winter then cast them in the spring. Four classics, in either 22k gold, nickel or copper in a pocket-sized tackle box. Customize your trolling kit! This special includes three Forty Niner casting and trolling spoons, and six colors of prism stickers in a tough Flambeau tackle tray. Mix and match for exponential color combinations! If Dad likes to troll for those cold water lunkers, then this is the gift set for him. Great value for Chrismas with the best from Al's to draw in those prized Salmon and Trout. Limited time offer. If Dad likes to troll for those cold water lunkers, then this is the gift set for him. Great value for Christmas with the best from Al's to draw in those prized Salmon and Trout. Limited time offer. Organize tackle boxes with American made hook bonnets. Keep the hooks sharp and get rid of the tangles. The only ones still MADE IN USA and at better prices than the imports. A great gift! 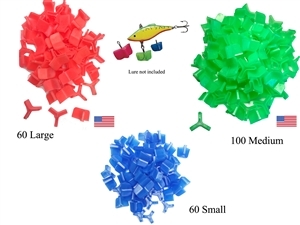 9 colors of the super tough Al's living lures in a tough Flambeau box. 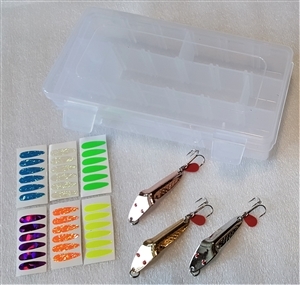 If your angler is serious about Stripers or Blue Fish, then they will love this set. All six of the new salt water colors in two sizes (three 3/4 oz and three 1 1/4 oz) in a tough flambeau tackle tray. Get them the toughest lures out there.